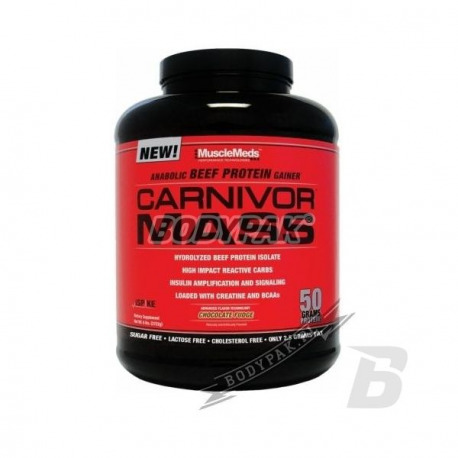 Carnivor Mass gainer is the most advanced on the market, much better than the typical mass gainer. Carnivor Mass combines unique hydrolyzed beef protein isolate (BPI), a double measure to strengthen the signal of insulin through a technology known as ISPIK. 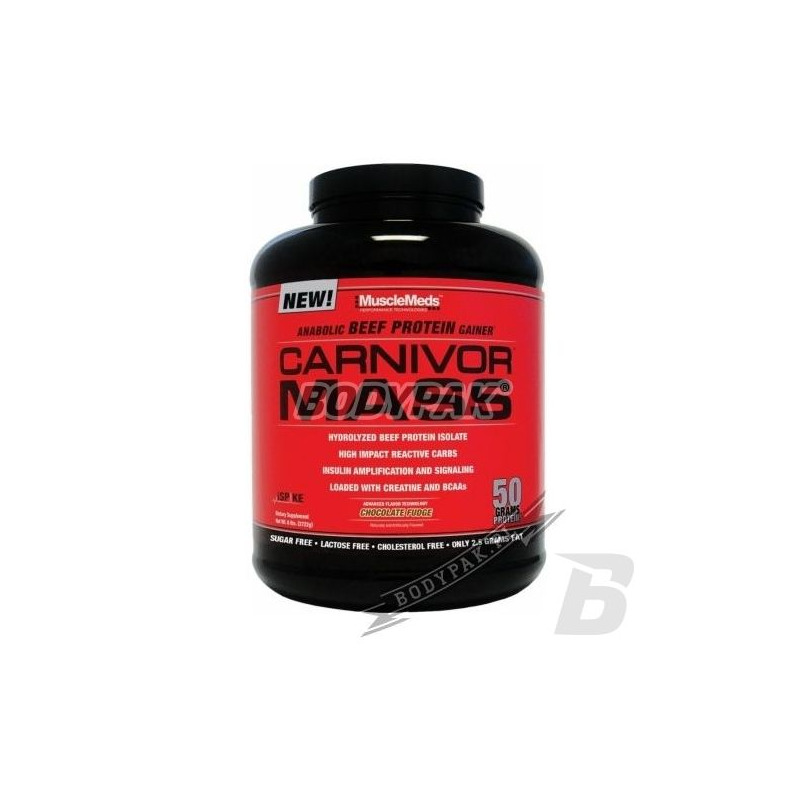 MuscleMeds Carnivor Mass - is the most advanced gainer on the market, much better than the typical mass gainer. Carnivor Mass combines unique hydrolyzed beef protein isolate (BPI), a double measure to strengthen the signal of insulin through a technology known as ISPIK. BPI and ISPIK acting jointly promote maximum muscle anabolism while minimizing fat storage. Beef protein isolate - provides muscle building the capacity of proteins red meat with higher levels of amino acids than any protein using: whey, soy, milk or eggs. BPI is even 350% more concentrated in terms of muscle building protein than steak and neither has any fat or cholesterol. Składniki: ISPIKE™ Technology [Consisting Of Release-Amplifying Reactive Carbohydrate System (mikrocząsteczkowa maltodekstryna, mikrocząstecznowa waxy maize, amulaza, gluko-amylaza), and Signal-Amplifying System (Agaricus Blazei, D-Pinitol, 4-Hydroksyizoleucyna, oczekujący na patent związak chromu: Chromium 454™)], CARNIVOR-BPI™ [Hydrolizowany izolat białek wołowych, monohydrat kreatyny, L-glutamina, aminokwasy rozgałęzione (BCAA: L-leucyna, L-walina, L-izoleucyna), Anabolic Nitrogen Retention Technology™ Intermediates: GKG (alfa-ketoglutaran glutaminy), OKG (alfa-ketoglutaran ornityna), AKG (alfa-ketoglutaran), And KIC (Alpha-Ketoizokaronian)], kakao, średnołańcuchowe tiglicerydy, naturalne i sztuczna aromaty, dwutlenek krzemu, sól, acesulfam K i sukraloza.